Disclaimer: If you don't have required knowledge and training to handle electric main lines, DO NOT try this on your own. Take professional help from an electrician. It might cause life-threatening electrical injuries. Thus exercise caution. For better understanding, I would recomend you to go through following posts. There are many MQTT brokers available as cloud service. 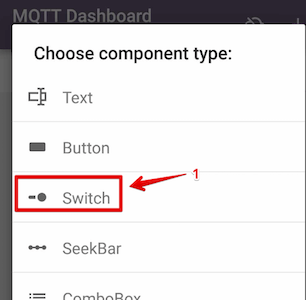 Even, you can install any MQTT broker (e.g. Mosquitto) in your local machine and use the same too. 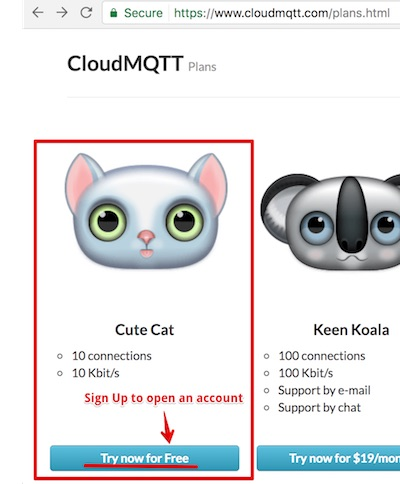 Open CloudMQTT website and sign up for Cute Cat plan. Login and open Control Panel. Click "Create" button. Create a new CloudMQTT instance. 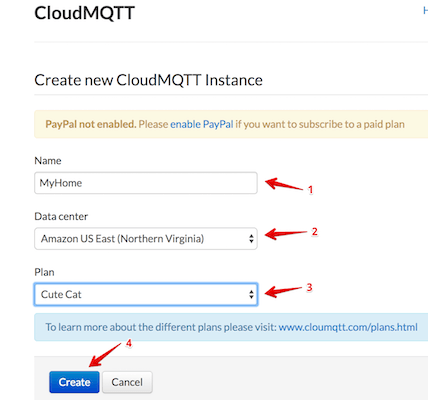 Click the "Details" button of newly created CloudMQTT instance (e.g. "MyHome"). 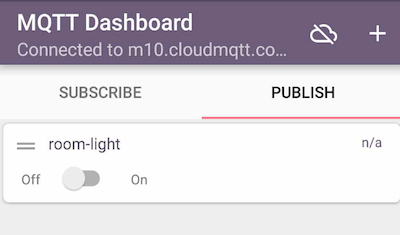 Later, we?ll use following details from CloudMQTT console to connect to the CloudMQTT broker from clients (ESP8266 device and IoT MQTT Dashboard android app) to publish and consume messages. 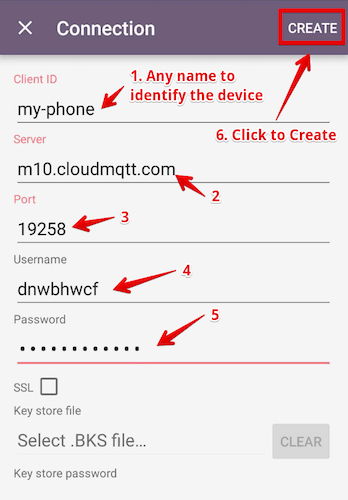 There are many MQTT client applications available in Google Play Store. Feel free to explore any one that suits your requirements. 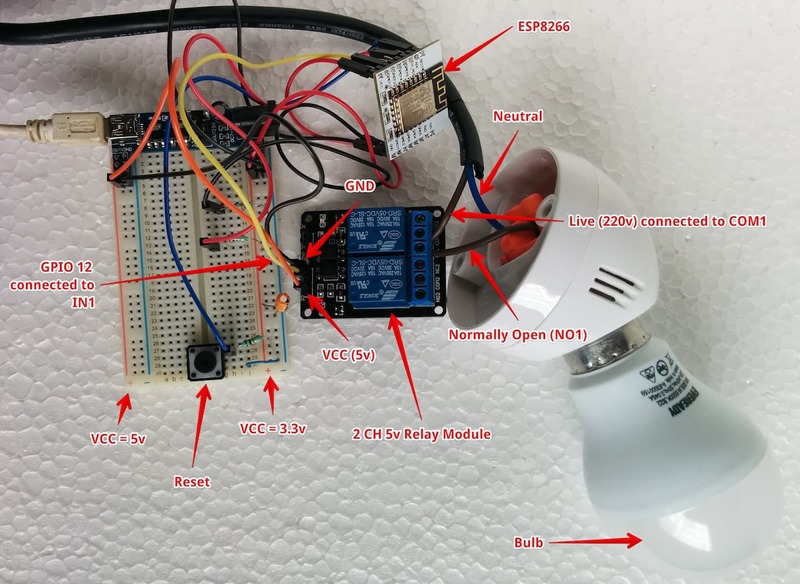 For this post, I am using IoT MQTT Dashboard. 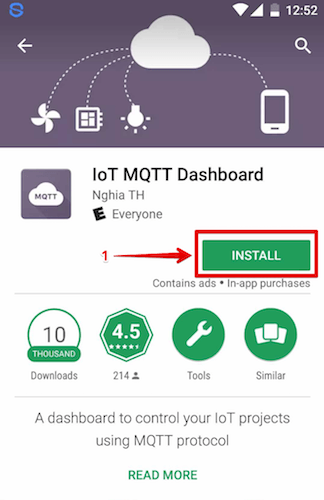 Open Google Play Store and install IoT MQTT Dashboard Android App. Open the application and click the Plus Sign (+) button to create a connection. 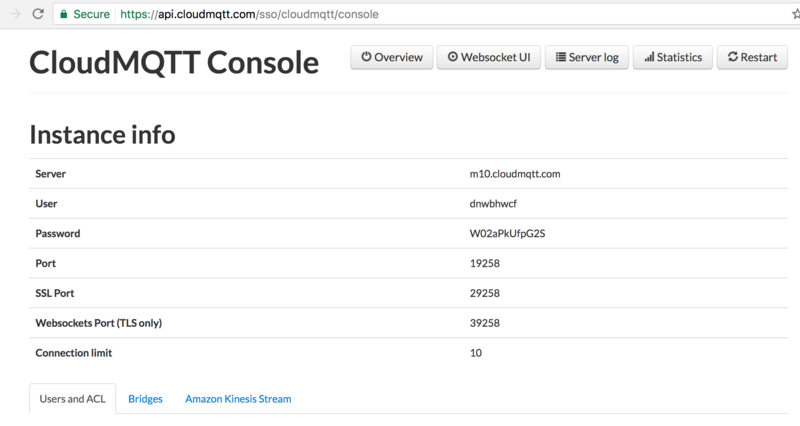 Enter all the details of CloudMQTT instance (e.g. "MyHome") and click "Create" button. That connection will appear in the dashboard. Open that connection. Open publish tab and click Plus Sign (+). Fill up all the fields and click the "Create" button. Switch button will appear in the Publish tab. Now, if we switch the button on or off, '1' or '0' will be published to the topic (e.g. room/light) respectively. If any MQTT client is subscribed to the same topic, it?ll receive the value '1' or '0' accordingly. 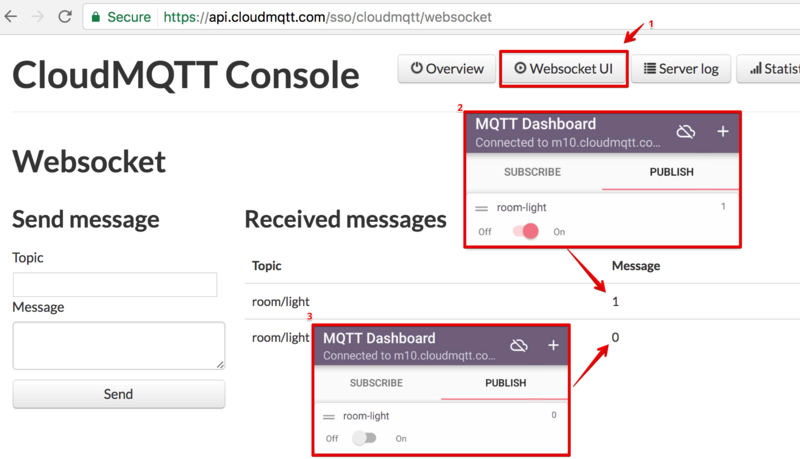 We can check the connectivity, by switching on/off the button few times and verify the value in Websocket UI of CloudMQTT Console. Connect all the components as shown in the diagram below. CAUTION: DO NOT touch any open wire or part of the circuit while main power is on. There is risk of electric shock. Connect to WebREPL of ESP8266 using Chrome or Firefox browser. Press Ctrl & E to enable paste mode. Paste following code and Ctrl & D to finish. 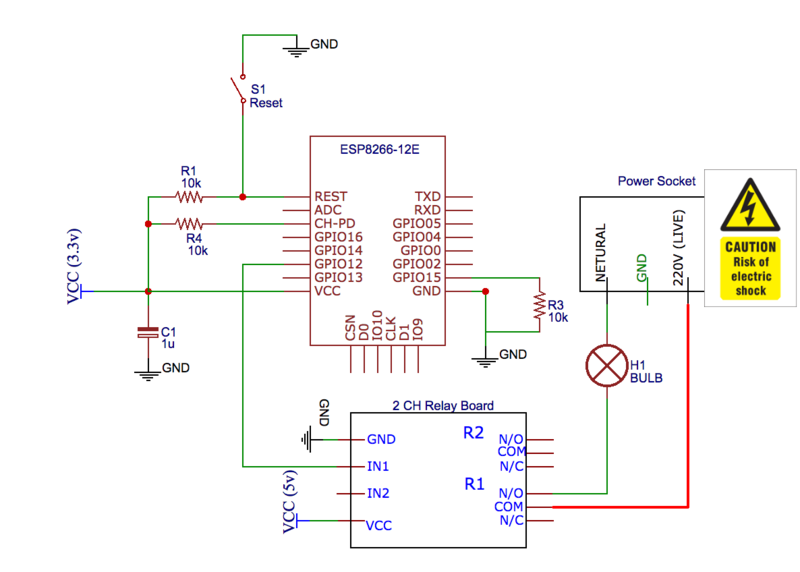 Note: The relay used in my circuit gets on for low output of the GPIO Pin. That is why, I have called bulbPin.low() (line #26) for '1' message received from CloudMQTT and bulbPin.high() (line #28) for '0'. It may be opposite in your case. Call listen() in the REPL prompt. 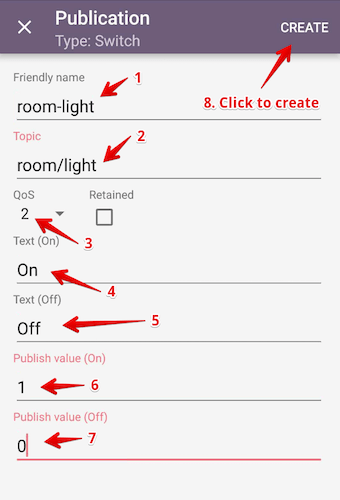 If everything goes well, button switch on/off in IoT MQTT Dashboard android app will switch the bulb on/off accordingly. Note: To configure ESP8266 to listen to the topic as soon as it starts, you need to append the code at the end of the main.py. It runs after the execution of boot.py. If main.py does not exist in the device, then create a new file named main.py and paste all the code. Finally, upload that file to ESP8266. Refer step #5 of my earlier post Configure STA_IF interface of ESP8266 (MycroPython firmware) to connect with WIFI network automatically on boot.